What’s new? What’s next? I enjoy working on creative paper doll projects because I’m always facing a new challenge. From the moment that Jenny Taliadoros and I first start thinking about a new book for me to create, I am a man obsessed. Before I begin the first rough sketches, my head is whirling with possibilities and options. Recently, Jenny and I were discussing how people “play paper dolls.” Kids usually imagine make believe stories, but what about grown-ups? I think that cutting out the dolls and their clothes is easy and rather relaxing. Then comes the fun of dressing the dolls. That’s “playing,” bringing the paper dolls to life. That’s why I like vintage paper dolls better than today’s dressed-figures with a hole for the face to peek through. I like to have an assortment of items that can be mixed and/or matched, creating a fabulous outfit after “trying on” several choices. My next book is dedicated to collectors who enjoy assembling a fashionable total look. POP TRENDS PAPER DOLLS will have three dolls, different types and a book loaded with items…eight pages of trendy visions: Romantic, Exotic, Gypsy, Minimal, Futuristic, Nostalgic, Athletic and Uniform. I’ve already designed the clothes and I’m working on creating three dolls with very different images to inspire an almost endless array of trendy outfits. 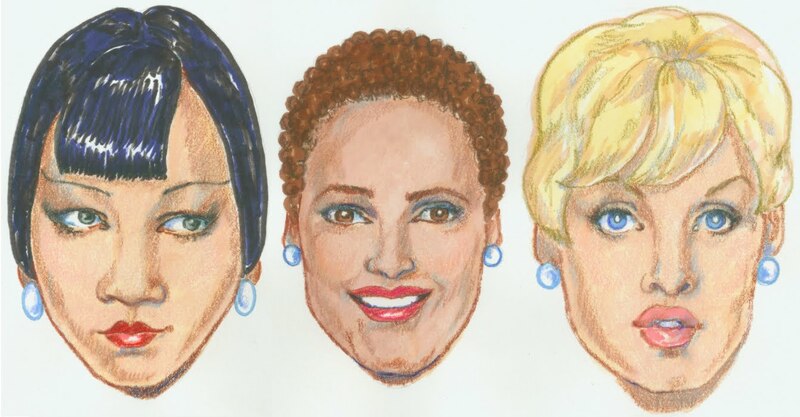 Work in progress, a trio of paper dolls to dress in trendy new fashions. Choosing a new color is an art and a science. Fashion designers rely on Pantone, a company that bravely announces an annual “color of the year.” Most years, Pantone gets it right. Last year’s color, “Greenery”, was described as being symbolic of new beginnings, fresh and zesty yellow-green that evokes the first days of spring. This year’s choice is “Ultra Violet,” a dramatically provocative and thoughtful purple. Thoughtful? The current fashion collections are not yet touting purple. Instead, designers seem to be thinking pink again, not Barbie bright, but soft misty shades that look familiar. They were recently red-hot in 2016 when youthful Millennials dared to decree surprising pinks to be cutting edge. 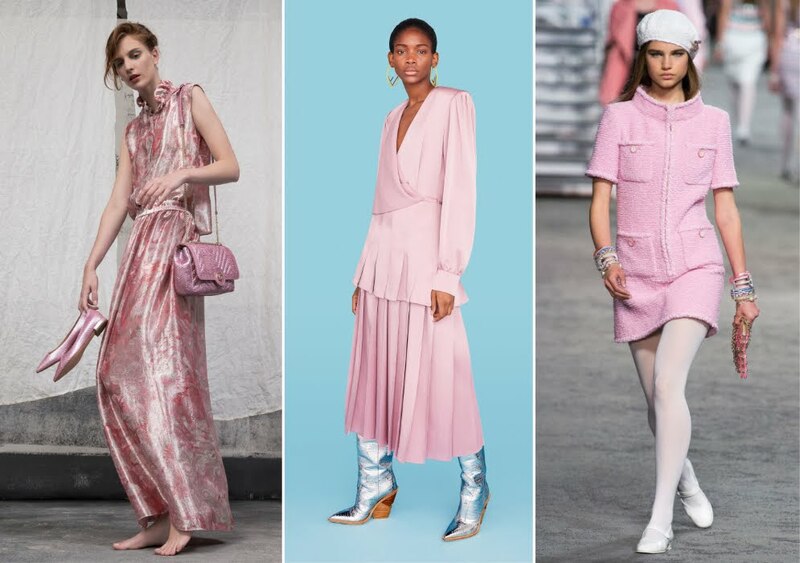 (Pantone called it “Rose Quartz.”) Is fashion going so fast that it’s impossible to make a dictate about color? Or is it just a question of timing, a self-fulfilling prophesy? Pantone’s 2016 Rose Quartz, 2017 Greenery and 2018 Ultra Violet. Re-thinking pink in the current 2019 Resort collection from Gucci. Giorgio Armani, Fendi and Chanel re-thinking pink for Resort 2019. “Influencers” are the new buzzers making news in the fashion world these days. 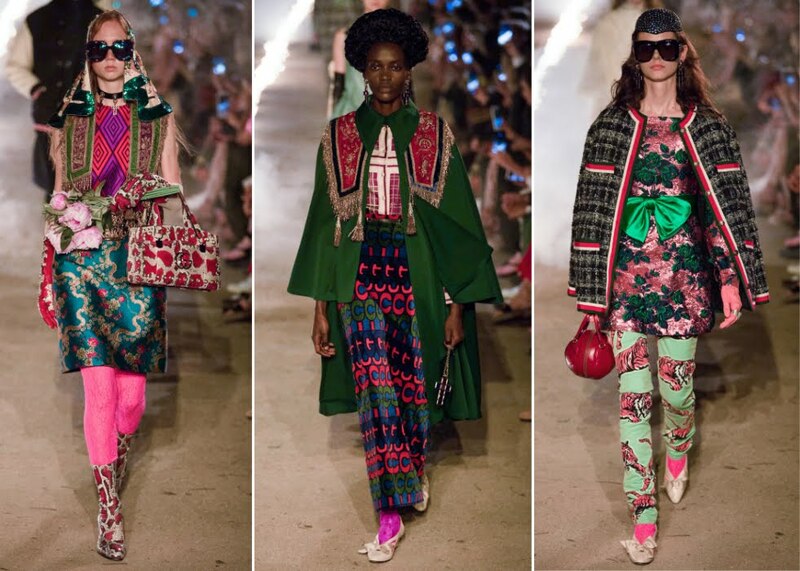 They are not very different than the dynamos who have always encouraged fashion to move, to inspire, to propel change. Vogue Editor Diana Vreeland was a powerhouse influencer. So was the Duchess of Windsor, as were Babe Paley and Jacqueline Kennedy. They were role models, taste-makers, and they were greatly admired and imitated. Today’s influencers have something that Diana, Wallis, Babe and Jackie did not. They have the Internet’s Social Media, that curious platform of (too often) mis-information and entertainment that has spawned the Twittersphere as a means to give Andy Warhol’s prediction of 15 minutes of fame to the new breed of influencers and their iPhones. In order to grab an audience in such a crowded cyber world, sensationalism rules. Pity the poor young fashionista who is influenced by Gucci, by Louis Vuitton, by Balenciaga…by so-called designers who are really nothing more than stylists managing too often to disguise the beauty, innovation and creativity in fashion today. The cutting edge today. Balenciaga and two by Louis Vuitton. 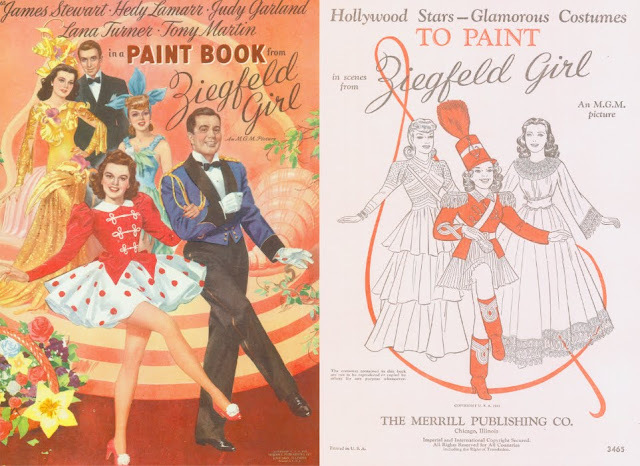 Regular readers of my monthly blog probably already know my very favorite movie is Ziegfeld Girl, made by MGM in glorious black-and-white. I always thought it was a shame that it had not been filmed in Technicolor. Of course I own the DVD. I also have the 1941 paper doll book, the gem of my collection. 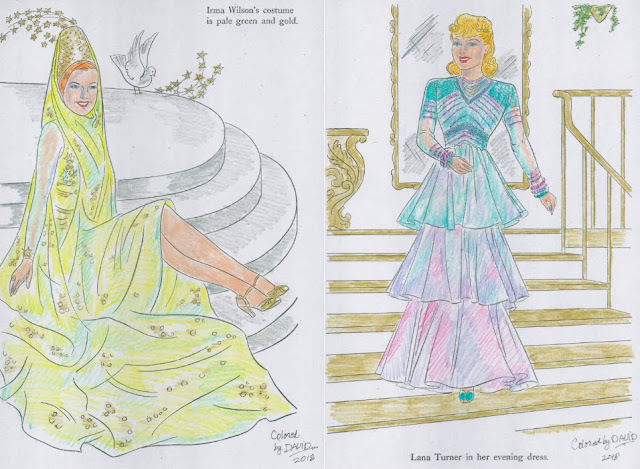 For years I pined to own the coloring book, a rare treasure. Eureka! A few years ago at the annual convention, I found the coloring book, UNcolored! The cover art is quite magnificent, but the pages are disintegrating with age (Coincidentally, my own age! 77!) I had copies made of the book, and even though the paper of the original is yellowing and the copies are too gray, I’m coloring some of the copied pages using tender loving care. I’m excited and honored to share my love of the film by creating a souvenir paper doll book to present to all the conventioneers next month. ”Ziegfeld Girl” vintage 1941 coloring book cover and page. Two pages of the 77 year old book colored by 77 year old me! Tomorrow’s fashion talent? 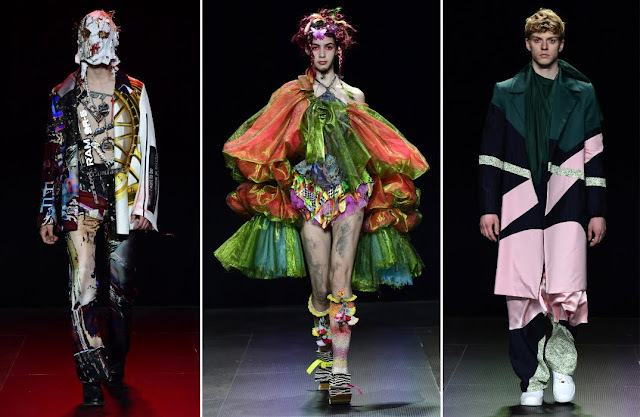 The Fashion Masters graduates of Antwerp’s Royal Academy of Fine Arts are eight views of envelope-pushing design. 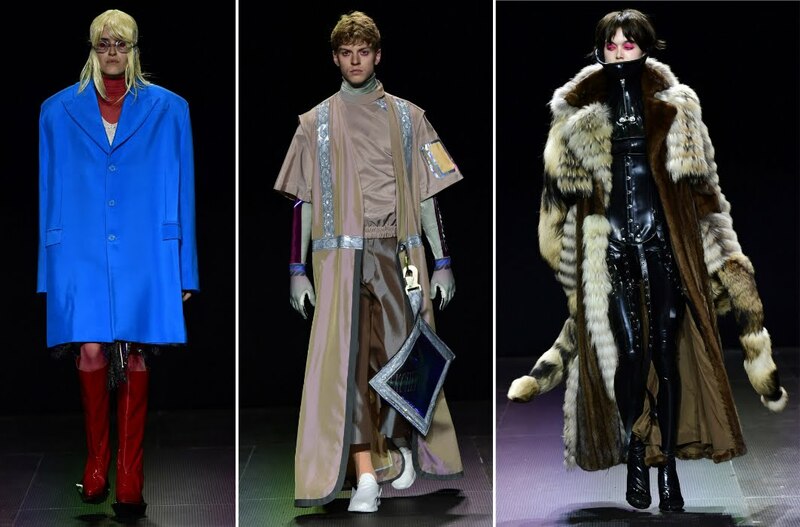 The prestigious college has produced several superstar designers in the past, and this year’s group could/should display forward-thinking, avant garde fashion. Even though there was rampant creativity on display, it all seemed somehow vaguely familiar: fashion as an art form, impossible to assimilate into a modern real life. Inspirations were duly discussed and included the Aussie outback and a wardrobe for flamboyant 21st Century criminals. 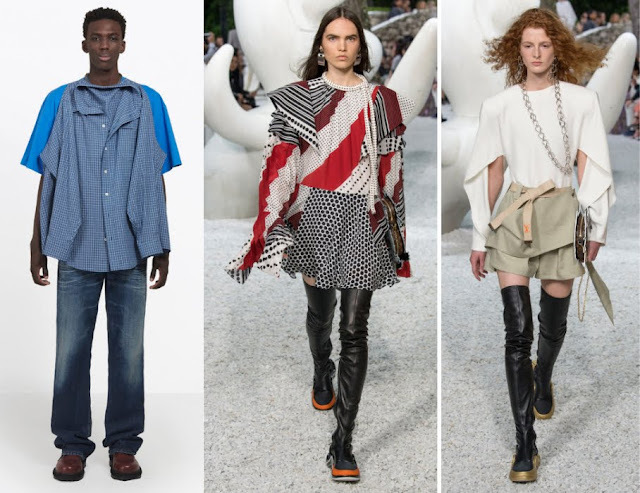 It is noteworthy that current cutting edge fashion has abandoned stark black Minimalism and is now a colorful cacophony of various silhouettes. Predrag Petrovic, Shayli Harrison, Michal Gruca. Gennaro Genni Velotti, Stefan Kartchev, Kjell de Meersman.